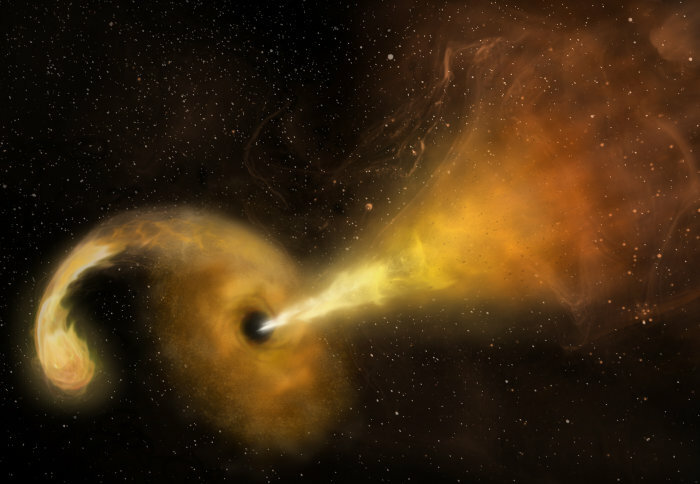 Now, these jets have been observed as a black hole, which is 20 million times more massive than our Sun, shredded a star more than twice the Sun's mass. Astronomers tracked the event with radio and infrared telescopes in a pair of colliding galaxies called Arp 299, nearly 150 million light-years from Earth. 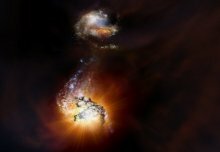 Astronomers using the William Herschel Telescope in the Canary Islands had discovered a bright burst of infrared emission coming from one of the colliding galaxies in Arp 299. Follow-up observations with the National Science Foundation's Very Long Baseline Array (VLBA) revealed a new, distinct source of radio emission from the same location. Dr Seppo Mattila, from the University of Turku, said: "As time passed, the new object stayed bright at infrared and radio wavelengths, but not in visible light and X-rays. The most likely explanation is that thick interstellar gas and dust near the galaxy's centre absorbed the X-rays and visible light, then re-radiated it as infrared." Continued observations carried out over nearly a decade showed the source of radio emission expanding in one direction, just as expected for a jet. The measured expansion indicated that the material in the jet moved at an average of a quarter of the speed of light. ‘A dust-enshrouded tidal disruption event with a resolved radio jet in a galaxy merger’ by S. Mattila et al. is published online in Science.